I've been enjoying a bit of sleuthing around old collections of photos and news articles duirng the past week. Today, I was going through the on-line collection of photos taken by Solomon Butcher, who worked tirelessly (it appears) during the late 1800s and early 1900s to document the pioneers in Nebraska. 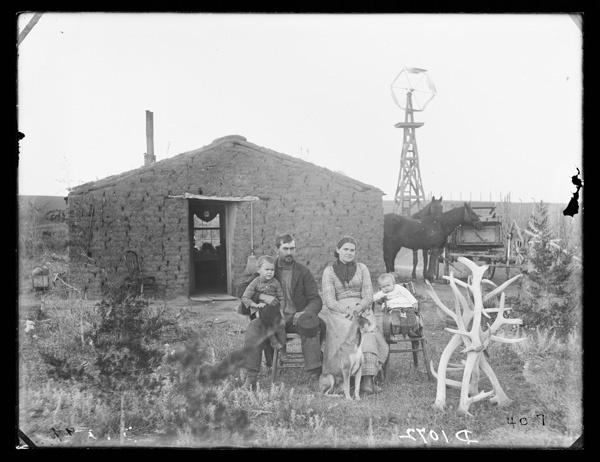 Many of Butcher's photos are similar to this photo--a family sitting in front of the sod house. This particular photo is of the B. F. Cox family near Cliff Table, Nebraska (Custer County, near Broken Bow), and it was taken in 1886. There are a couple of things that impressed me as I looked at this collection. First, every house photographed in rural Nebraska in the 1880s was a sod house. But, by 1905, only 25 years later, every photograph is of a two-story wood-frame farmhouse. Amazing the difference of 25 years, just in terms of housing. I'm sure the conditions of sod houses (many photos, like this one, show a broom near the front door!) contributed to families wanting something better! But, the other thing that interested me was that almost every photo of families in front of sod houses included antlers of deer or elk, or bison skulls. Sometimes positioned on the roof, sometimes laid against the house. But, obviously positioned for the camera. It is clear that the family has prepared their homestead, and themselves, for the photo. The only other common 'props' shown were domestic animals, windmills, and guns. What were these early settlers trying to say with these props? I'm guessing they were sending a message back to their family members, back East: "We are surviving!" "We are harnessing the resources of this country [windmills, horses]." And, in the case of the antlers and skulls, "Look at this amazing bounty of wildlife that is around us!" Some of the antlers and skulls appear to be 'sheds' (antlers found on the ground), but records indicate game animals were important to the survival of early pioneers. I was especially impressed with the size of these elk antlers shown in this particular photo. There haven't been elk in Custer County for a long time--we do have elk in the Pine Ridge of western Nebraska. See anything else in this photo? It's fun to get a peek into their lives, through one, posed, moment in time. Photo is a public image from the works of Solomon Butcher, in collections of the Nebraska State Historical Society, [Digital ID 10200]. Cool - do I see a couple of red cedar in the picture? Larkin-- If you come across any portraits of Brownlee's in Cherry County or Gordon, NE-- let me know -- probabaly related. I noticed the windmill and window in the house. They have a dog and the wife/mother looks like she is smiling.